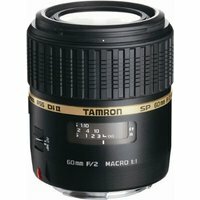 Tamron's 60mm Macro Lens has been designed specifically for DSLRs with an APS-C sized sensor and is the first lens of this type with a maximum aperture of f/2. The lens can be used as close as 10cm away from the subject and, thanks to its internal focus mechanism, the front element does not move when focusing, so it is less likely to scare away the more flighty of macro subjects. The f/2 aperture gives a beautifully shallow depth of field and out of focus areas appear naturally soft. This characteristic combined with an equivalent focal length of 93mm means that the Tamron 60mm Macro also makes an excellent portrait lens. With 1:1 life-size reproduction opening up whole new worlds of photography, the Tamron SP AF 60mm f2 Di II LD (IF) Macro will be a welcome addition to any photographer's camera bag.